After a commanding position, Maghsoodloo Parham of Iran conceded a draw for the first time in the tournament to Safarli Eltaj of Azerbaijan but maintained his one point lead with 7.5 points at the end of the eighth and penultimate round of the Sharjah Masters International Chess Tournament, organised by Sharjah Culture & Chess Club at its ultra modern venue. 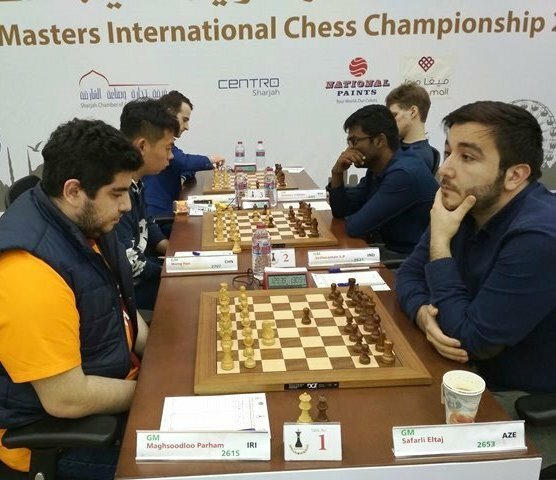 Safarli who extricated half a point from Maghsoodloo and the top seed Wang Hao of China are on the second spot with 6.5 points each. Maghsoodloo starting with Reti opening, managed to grab a pawn on the 33rd move, after a series of exchanges with Safarli. But he mismanaged his bishop in an almost winning position and had to be content with a draw in 71 moves. Wang Hao forced the queen exchange on the 23rd move against SP Sethuraman of India in the English opening. Thereafter Wang held an upper hand with his double bishop advantage against a bishop and a knight in the end game. Sethu lost a valuable pawn on 37th move and Wang sacrificed his bishop to get his b- pawn promoted to a queen. Sethu fought for a few more moves, but surrendered when Wang began to mop the pawns one by one. 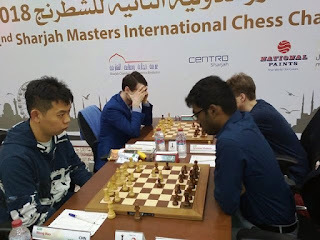 The queens of Kryvoruchko Yuiry of Ukraine and Vishnu Prasanna of India were off the board by 25th move of the Ruy Lopez opening, employed by the former. 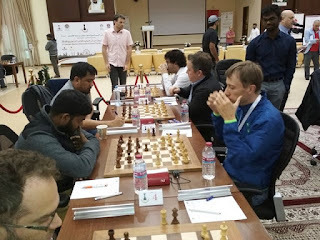 Though Vishnu had a rook and bishop to that of rook and knight of his opponent, Kryvoruchkov’s powerful outside passer pawn could not be stopped, forcing Vishnu to resign after 56 moves. Naiditsch Arkadij of Azerbaijan played patiently to wat for his opponent IM DImakling Oliver of Philippines to commit a mistake in a Scotch game. When Dimakling buckled under pressure, Arkadij seized the opportunity to strike and post a win. 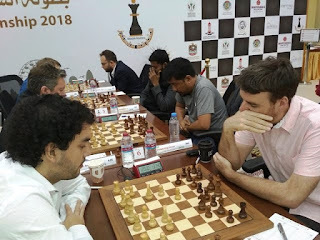 Gawain Jones of England lost his second successive game, this time to Mareco Sandro of Argentina in a Kings Indian defence. He could not handle the opponent’s connected pawn structures on both flanks and paid penalty for it in 85 moves. In a queen and equal pawns ending arising out of Kings Indian defence, Adly Ahmed of Egypt had a passer pawn, which paved the way for victory to him against Kovalev Vladislav of Russia in 43 moves. In the encounter between the Indian grandmaster B Adhiban and Eljanov Pavel Ukraine,the Berlin defence couldnot be cracked and both settled for a draw on the 25th turn by repeating their moves. 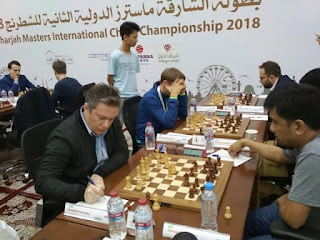 The symmetrical English opening between Tabatabaei Amin of Iran and the currently the youngest grandmaster in the world Abdusattorov Nodirbek ended in a tame draw with just two kings left on the board after 46 moves.